The movie "District 9" takes place in Johannesburg, South Africa and explores the scenario where aliens invaders are housed in slums. It had tohappen: invading aliens are now the good guys. Hollywood loves to turn the tables on its ownhackneyed formulae. For decades, Native Americans were on an endless warpath inthe movies,getting up in the morning with only one item on their ?to do? list: namely,mount yet another attack on gnarly ranchers and the occasional wagontrain. But these days, the Indians in the popcorn palaces are laid back;sage and sympathetic. Overturningclich?s always plays well, because doing so allows filmmakers to meld helpfulfamiliarity (you know how these guys are supposed to behave) with surprise(they?re not conforming to type). In?District 9,? a hubcap-shaped alien mother ship ? looking like a kit bash of afew thousand Revell model tank parts ? comes to Earthand stalls over Johannesburg.The confused occupants disembark, and quickly confront their South Africanhosts with yet another social problem (as if the country needs one). Where do we put these dudes? The SouthAfricans respond with a nod to history by stuffing the aliens into a massivecamp in the bad part of town: Sowetofor extraterrestrials.The accidental tourists multiply like rabbits, and after a few decades turntheir township into a really unattractive neighborhood. 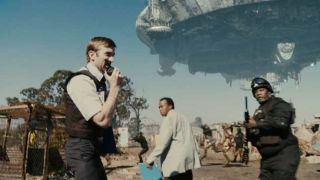 Attempts todeal with the aliens (read: get them out of everyone?s hair) become the day jobof a stumbling Afrikaner (played by Sharito Copley) ?a bureaucrat who?s in the employ of a massive, and manifestly malevolent,defense contractor. The mixture of innocence, danger, and squalor is at firstconfusing; ten minutes after the opening titles, you think you?re watching ?Borat? meets "Blackhawk Down.? The socialcommentary in ?District 9? is about as obvious as Vin Diesel in a Munchkin bar,and reviewers have had a nice time trying to figure out the political intent ofthe film. But what about the alien angle? Is it realistic to think that a passel of extraterrestrials could really getstranded on Earth, confronting us not with havoc and destruction, but with afar more prosaic problem: accommodation? Probably not. These guys cause social problems only because they?re pretty much likeus. Sure, physically they?re a bonkers blend ofRay Harryhausen skeleton warriors, oversizedlobsters, and that tentacled Davy Jones characterfrom Pirates of the Caribbean. With more mouth parts than a bagfull of grasshoppers, these guys aren?t attractive. Unlike the smooth,calm-and-collected grays that entice Scully and Mulder, the aliens in ?District 9? are upright crawdaddys. What?s hardto swallow about these extraterrestrials-in-residence is that they think likeus, share our emotions, and even have the same body gestures. And while they?retechnically capable of a few things we?re not ? interstellartravel comes to mind ? they?re not obviously more advanced. We caneven operate their rockets and weapons, although you have to sport a bit ofalien DNA to do this (an idea reminiscent of a long-ago proposal that would usebiometric sensing to limit the use of handguns to legitimate owners). Bottomline: if you could get over their fruit de merappearance, you might sit next to these ?District 9? residents on the bus. All ofwhich makes them comprehensible and ultimately sympathetic. But trust me, real aliens will be real different. They won?t have DNAthat can mix with ours, they won?t enjoy dining on cat food, they won?t havetechnology we can instantly operate, and they won?t be like Neanderthals? just another species that?s pretty similar, but not similar enough to getalong. That?s amistake that Hollywoodmakes repeatedly: the anthropocentric view that aliens, if they?d only dress better,could pass for humans. Filmmakers must adopt this point of view, forotherwise the aliens would be, well, too alien. ?District9? breaks new ground by condemning alien invaders to a degrading, ghettoexistence. It?s undoubtedly a long way from reality, but then again, soare the aseptic grays who come to Earth in immaculate, polished spacecraft withno more subtlety of intent than to probe our privates. It?s nicewhen the bad guys can occasionally get out of character.